The wider news world tends to discourage public u-turns by punishing politicians for ‘flip-flopping’. But a turnaround at the right junction can be a win for all: the replacement of a gross negative with an unmitigated positive. So it is here: the South Korean eSports organisation which previously prevented women from competing in Hearthstone has revised its rules. Its designated male-only tournaments will henceforth be open to all – and they’re keeping their female-only events in an effort to “improve representation”. If you’re some how not playing the elegant CCG, you should read our Hearthstone review and find out why you really should. In a statement published this morning, the IeSF recognised that their policy on gender division had been “brought into question”. The organisation held an emergency board session yesterday to address public concerns, and afterwards outlined two event categories: an ‘Open for All’ division, and another reserved for women. 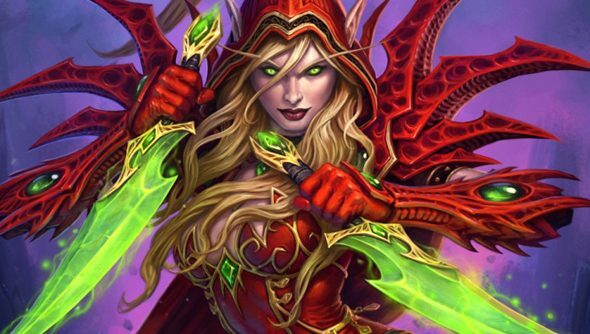 The events initially designated as male-only, which included an international Hearthstone tournament, will now be open to all genders. Female-only events in StarCraft II and Tekken Tag Tournament 2 will remain unchanged. The IeSF intend to continue running events specifically for women, to provide female pros “ample opportunities” to compete in a “male-dominated industry”. “Female gamers make up half of the world’s gaming population, but only a small percentage of eSports competitors are women,” they wrote. “The IeSF’s female-only competitions aim to bring more diversity to competitive play by improving the representation of women at these events. The IeSF had originally designated particular games to different genders, in imitation of “legitimate sports”. Given how wrongheaded a starting point that was, it’s tough to imagine a better outcome. It’s nice when internet rage occasionally yields something good, isn’t it?